Grahamstown is a city that is located in the Eastern Cape province of South Africa with a population of about 70,000 people. It is situated just off the N2 between Port Elizabeth and Port Alfred. 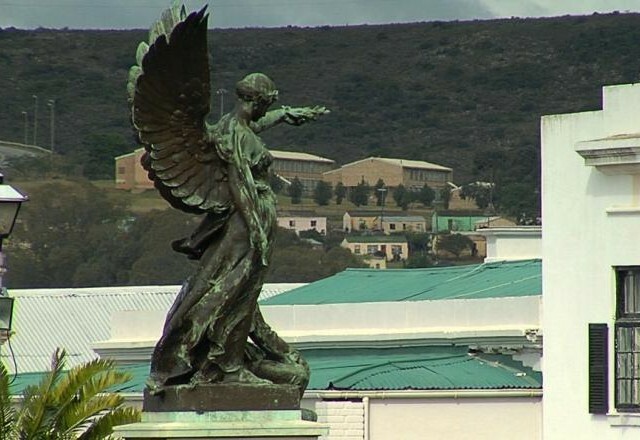 Grahamstown was discovered in 1812 as a military outpost by Lieutenant-Colonel John Graham as part of the effort to secure the eastern frontier of British influence in the then Cape Colony. This effort saw a great deal of conflicts arise between the British and the Xhosa’s, whose land laid just to the east. The height of the frontier conflicts occurred on the 22nd of April 1819 where the Xhosa worriers numbered in their thousands and lead by Nxele (Makana) launched a full scale attack on the British. The British were highly outnumbered by the Xhosa’s, 28 to 1, but it was the firepower of the British that was to be the order of the day. The battle lasted a mere few hours and ended in the surrender of Nxele and his subsequent imprisonment on Robbin Island. A year after the brutal battle of Grahamstown, the 1820 settlers landed in Algoa Bay (Port Elizabeth) in an effort to ease the rise of unemployment in Britain due to the Napoleonic wars. The Settlers were granted farms in the region but many of them severely lacked the agricultural knowledge needed to succeed in the region as they were artisans and craftsmen by trade. This coupled with the harsh living conditions led to many Settlers abandoning their farms and relocating to towns to pick up their trades. The influx of Settlers and businessmen looking for new opportunities helped Grahamstown become a bustling centre for trade and by the 1930’s Grahamstown was the second largest city in the country. Today, Grahamstown is regarded as the heart of the tourist route known as ‘Frontier Country’, it is part of one of the most diverse ecological regions in South Africa, with thousands of acres devoted to nature and game conservation. Grahamstown is home to the second oldest botanical garden, The Makana Botanical Gardens, established by the British in the Cape Colony in 1853. The oldest fossil land animal, from the Gondwana supercontinent, was discovered just outside of Grahamstwon in 2013. The fossil is a new species of scorpion that lived here around 360 million years ago before the dinosaurs roamed the earth. The annual National Arts Festival is hosted in Grahamstown and attracts more than 200 000 people from across the world which makes it the biggest festival of its kind on the African continent. This festival runs for 11 days, starting at the end of June until the beginning of July. It takes place across the city at approximately 60 venues, including theatres, schools, churches and outdoor locations for the street performances. Grahamstown is by no means the second largest city anymore, yet it has evolved into a melting pot of diverse culture with academic excellence at the forefront of the Town’s identity.